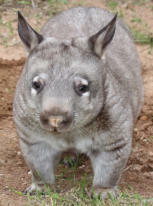 Val Salmon of Wombat Fauna and Rescue has lived in the Ceduna and Nullarbor areas all of her life. Time spent in these areas growing up developed a robust love in her of the local native wildlife which in those days were quite numerous. From her early teens Valerie had many young charges (animals)of different varieties. birds Wombats Kangaroos Emu’s and even a Dingo called Nulla. The Idea of setting up a rescue center here in the Ceduna area stemmed from a number of reasons Due to the sealing of highways there has been a major increase of car and truck related deaths maimings and blunt traumas to the wild native populations of animals especially on the Nullarbor side of Ceduna. The amount of baby animals left motherless told us that there will always be a need for native animal care in this area and to us. The solution was simple ; form a not for profit organisation now called Wombat Fauna and Rescue and to take care of as many of the young animals as possible.